Bartlett, Irving H. (1978). Daniel Webster. Baker, Jean (1983). Affairs of Party: The Political Culture of Northern Democrats in the Mid-Nineteenth Century. Benson, Lee (1961). The Concept of Jacksonian Democracy: New York as a Test Case. Brown, Thomas (1985). 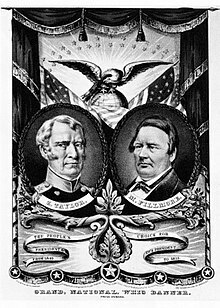 Politics and Statesmanship: Essays on the American Whig Party. Cleaves, Freeman (1939). Old Tippecanoe: William Henry Harrison and His Time. Cole, Arthur Charles (1913). The Whig Party in the South. Formisano, Ronald P. (1983). The Transformation of Political Culture: Massachusetts Parties, 1790s–1840s. Hofstadter, Richard (1969). The Idea of a Party System: The Rise of Legitimate Opposition in the United States, 1780–1840. Holt, Michael F. (1992). Political Parties and American Political Development: From the Age of Jackson to the Age of Lincoln. Holt, Michael F. (1999). The Rise and Fall of the American Whig Party: Jacksonian Politics and the Onset of the Civil War, Oxford University Press. ISBN 0-19-505544-6. McCormick, Richard L. (1986). The Party Period and Public Policy: American Politics from the Age of Jackson to the Progressive Era. McCormick, Richard P. (1966). The Second American Party System: Party Formation in the Jacksonian Era. Pessen, Edward (1977). The Many-Faceted Jacksonian Era: New Interpretations. Remini, Robert V. (1991). Henry Clay: Statesman for the Union, W. W. Norton & Company. ISBN 0-393-31088-4. Remini, Robert V. (1997). Daniel Webster. Schurz, Carl (1899). Life of Henry Clay: American Statesmen, vol. 2. Shade, William G. (1983). "The Second Party System" Paul Kleppner, et al. (contributors) Evolution of American Electoral Systems. Silbey, Joel H. (1991). The American Political Nation, 1838–1893. Van Deusen, Glyndon (1973). "The Whig Party" Arthur M. Schlesinger, Jr. (ed.) History of U.S. Political Parties, 1:331–63, Chelsea House Publications. ISBN 0-7910-5731-3. Wilentz, Sean (2005). The Rise of American Democracy: Jefferson to Lincoln.